To make sure your basement remodeling project is done right the first time, be sure to choose a basement finishing expert that utilizes products that won't attract mold or moisture and won't damage easily over time. For a free estimate and to learn more about our financing options in Hibbing, Proctor, Eveleth, Grand Rapids, Hayward, Eau Claire, Bemidji, call us today. All of our high-quality products can ensure a basement environment that is safe, healthy and beautiful. Excellent return on investment. Finishing all or part of your basement is a definite way to increase the value of your house. A basement remodel ranks right up there with kitchen and bath remodeling in terms of improving a home's resale value. Plus, DBS offers financing and repayment options to keep the project within your budget. If you're thinking about finishing your basement, our basement finishing services and innovative basement remodeling system can ensure a dry, healthy basement the first time around. 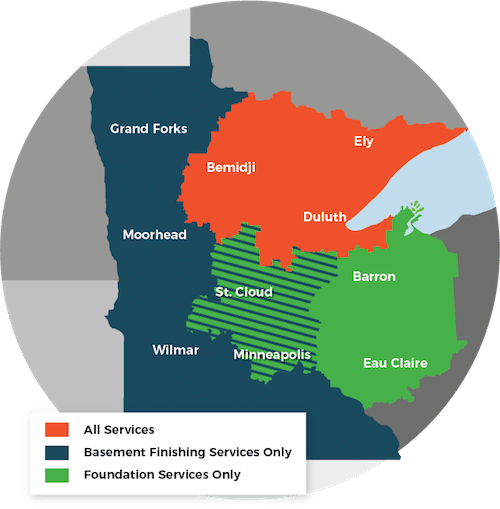 Our services are available in Cloquet, Two Harbors, Hermantown, St. Paul, Esko, Virginia, Ashland and many surrounding areas. Call us today to schedule an on-site inspection and free estimate!